A small selection of models from the whole portfolio – ten in fact, and generally the company’s best sellers in the UK – have gone on to be offered in superior specification Sovereign trim by Bürstner for the season ahead. It’s a way of making you pay just a bit more, too, of course, but at the same time it’s easy to see the attractions, which start on the outside for this island bed Ixeo Time variant here, with the graphite cab and alloy wheels. Also here, note the extra wide habitation door (it’s 70cm), plus standard awning. And to save you checking, that roof is a hail-resistant GRP. 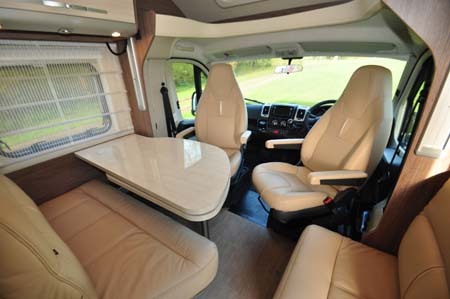 Base vehicle is Fiat’s low-frame Ducato, so –despite a pronounced swoop to the roofline, which in turn allows the fitting of a drop-down bed, overall height is still a sleek 2.75m. It’s all on a 3,500kg chassis as standard. Be warned, though, if you really want to take advantage of the full four-berth status this design offers, you might want to upgrade the chassis – just 335kg as standard is rather paltry. 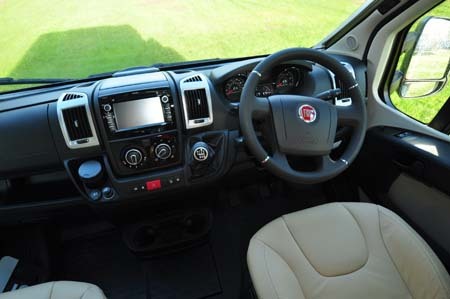 There’s certainly no holding back in the cab, where you get all manner of luxury – Zenec double DIN stereo system (also incorporating satellite navigation and a reversing camera system), padded steering wheel with leather finish, ditto for the gear lever, silver trim around the dash’ vents, and captain’s style swivel seats. That Ferra leather upholstery is standard Sovereign, too, continuing through to the lounge seating around a fixed pedestal leg table with plenty of adjustment as well as a large swing-out extension piece. Overhead, there’s the drop-down double bed. It operates electrically, via a key system on the kitchen bulkhead. But, it’s the island bed at the back that takes centre stage when it comes to sleeping. As with all Bürstners, you get supremely comfortable mattresses, complete with anti-allergenic covers that are also removable for cleaning, as well as slatted wood bed bases. Dimensions are pretty generous, too. 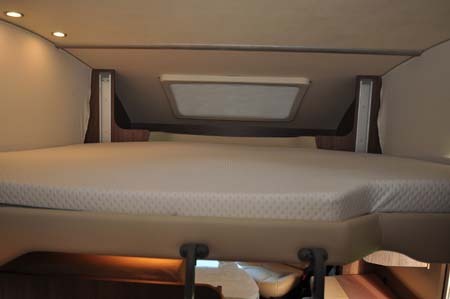 The island bed is 1.95m x 1.45m while the drop-down is 2.00m long, with width tapering from 1.39m to 1.28m. However, the latter bed comes down across the main doorway. Also, it doesn’t go particularly low, so you’ll need to use the ladder for access – it’s arguably the main price you pay for having everything in a sub-7.5m overall length. Step up to that bedroom area at the back, though, and it’s also generous in terms of space to manoeuvre around it, although there are steps up both sides, so standing room is restricted. 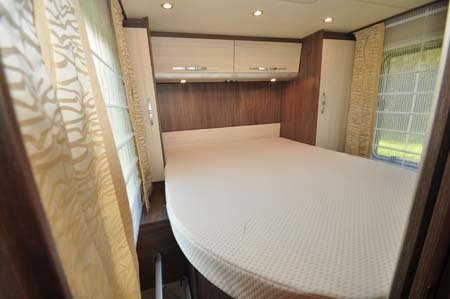 This main bed is flanked by his and hers wardrobes, both units also coming with generous countertop space at bed level, plus mains sockets and lockers in the bed base itself. There’s little compromise in the cooking and washing areas, either. The kitchen is L-shaped, boasting a three-burner hob and a circular sink, underneath which are three soft-close drawers and a particularly deep storage locker, while across the galley is one of the latest Dometic “narrow” fridges with removable freezer box, which seems smaller than its 145-litre total capacity suggests. A grill/oven sits over this on full production models, but a full oven is being offered as an alternative here if you feel the initial offering is too small. 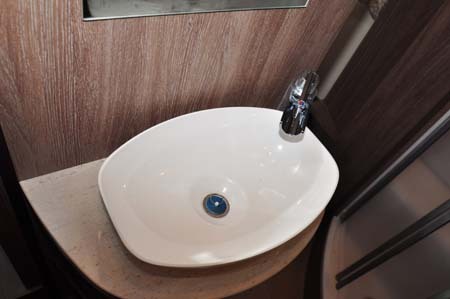 Beyond the kitchen, washroom facilities start with a solid plastic stand-alone sink with “waterfall” tap. 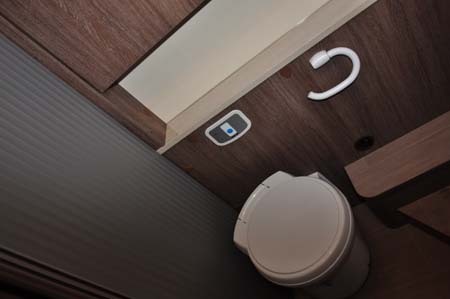 The toilet room is offside, its tambour door saves lots of space – and there’s a swivel-bowl toilet in here, along with sufficient space to use it! On the nearside, the shower room is fully lined, and comes with a bi-fold door and a vent overhead, but no window. The shower fitting also includes a rail that’s ideal for hanging wet clothing from. All these facilities can also be sectioned off to create a full-width washroom at the foot of the island bed, with space for dressing etc. 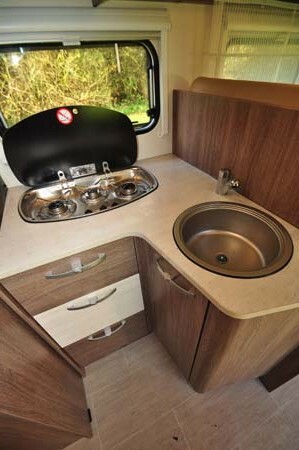 It certainly all adds up to a very grand motorhome, albeit not without plenty of competitors. But, it’s the Sovereign name that offers more than a hint that the extended specification is very much to UK tastes. And, as a Bürstner, there are of course simply loads of optional extras to choose from (even though a lot of these are covered off by the Sovereign package). 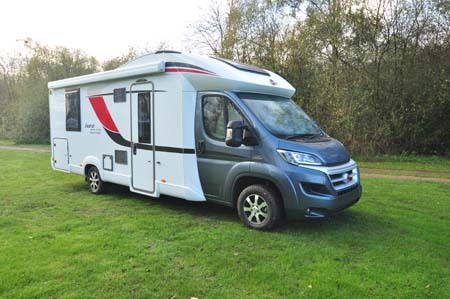 It’s not the cheapest low-profile motorhome you’ll get with an island bed, but it’s definitely one of the most comprehensively equipped. What do you think of the Bürstner Ixeo? Share your view in the comment box below. There’s more information on the Ixeo series at the Bürstner website. To find out more about our low-cost premiums visit the motorhome insurance discounts page. **On-the-road, including VAT at 20%.